Last Wednesday I attended the first session of the National Assembly under Macky Sall’s presidency. (For non-Africa followers who read the blog, Macky Sall was elected Senegal’s fourth president in March after unseating the 85-year-old Abdoulaye Wade of the Senegalese Democratic Party, which retains the majority in parliament for the moment). 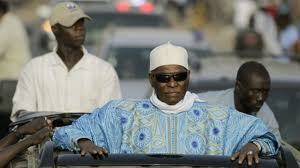 Former President Abdoulaye Wade during the 2012 presidential campaign. Photo: Rebecca Blackwell, AP. My presence was much to the delight of the friends I have made at the Assembly while perpetually waiting around to meet with legislators. My friends include the military men guarding the majestic looking front entrance (for congressmen only), the military men guarding the side entrance (for annoying researchers like me, as well as other commoners), the garage staff (of whom at least three regularly check up on whether I have ditched my (fake) American husband for a Senegalese man), legislative aides (much more professional), and the mechanics at the Total gas station across the street from the Assembly (the sweetest mechanics in the world). After Wolof greetings with the staff (lovely and long: “My friend, where have you been? Why haven’t you come to the Assembly for the last few days? Are you in peace? And the family, it is in peace too? Ah yes, I am doing fine, thank God!”), I was ready for the big day. Although I study African legislators, I had never tried to sit through a full session of parliament, and I will tell you right now that I failed. The meeting was originally scheduled for 3:00 pm, and because I was looking to meet some congresspeople before the session, I arrived at 1:45 pm. Subsequently, word spread that the plenary session would start at 3:30 instead. Of course, this meant that most congresspeople started arriving at 4:00 and things got going shortly afterwards. Iba Der Thiam, one of the Vice Presidents of the Assembly, renowned professor, and manager of the 60+ parties in the former president Wade’s camp (known in French as the “mouvance présidentielle”), was the only one sitting in the chambers promptly at 3:00 pm. His punctuality impresses me even more than my own! But at least Iba Der Thiam got to read and write while waiting for his colleagues. As a member of the general public, I sat in a room above the chambers and was separated from the Assembly members by glass windows. Two military men paced around the room and informed me that no photos or note-taking were allowed. Nor, apparently, was Kindle-reading permitted, but only because the military guards didn’t know what a Kindle was. I decided not to push the envelope. After that, I even asked for permission to answer my phone when it (inevitably) rang during the 5 hours I spent watching the proceedings. Ultimately, I had to leave at 8:30 pm because of paralyzing hunger pangs, plus the feeling I got that the session would not be ending any time in the near future, even though over 30 people had already spoken for three to five minutes each. Compared to the debates of British Parliament that used to be on television, the Senegalese session was certainly more fashionable and surprisingly calm given that the presidency just changed hands and the majority in parliament is now an opposition party rather than the ruling one. Socially, the group seems pretty well-integrated. There are three parliamentary groups, but the legislators did not sit in their formations. Most people circulated the chambers, shaking hands with their colleagues and making small talk before the President of the Assembly began the meeting. Men came dressed in beautiful pastel boubous (long tunics in mint green, salmon, yellow, or even neon light blue, with matching pants underneath) or in Western-style suits and ties. Women (around 30 of the 150 National Assembly members) never sported Western dress; instead, they arrived in fancy bazin dresses with head wraps to boot. I spotted lots of iPhones in the room: the legislators are indeed much richer than your average Senegalese citizen, but to the legislators’ credit, they spend their personal savings or even take out loans to meet the needs of their constituents. Personal problems that constituents ask Assembly members to help with include hospital bills, funerals, and educational expenses, just to name a few. The object of last Wednesday’s meeting was to vote on a law proposed by President Macky Sall and his government. It was the first “projet de loi” that the National Assembly evaluated since the March 25 presidential elections, when Sall defeated former president Abdoulaye Wade. Because the president proposed the law in question, the executive branch sent several representatives to listen to the debate. The most sensational presence was that of the new Minister of the Interior, Mbaye Ndiaye, who had been kicked out of parliament in 2009. 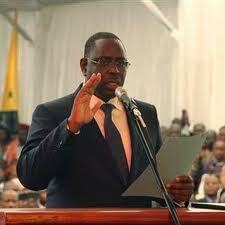 Senegal’s current president, Macky Sall, taking his oath of office on 2 April 2012. Photo: AP. Why had Ndiaye been kicked out? The short answer is: because he was friends with Senegal’s new president, Macky Sall. In 2009, the current president Macky Sall was the National Assembly president and a member of former president Abdoulaye Wade’s party, the PDS. Because Sall wanted to inherit the PDS upon Wade’s retirement and therefore disapproved of Wade’s scheme to leave the PDS to his own son Karim), Sall used his capacity as National Assembly leader to demand an audit of Karim Wade. For President Wade had given Karim the control of ministries that allowed him to cultivate followers who value public service provision; for instance, in 2007, Karim was the minister in charge of preparing Dakar for the International Islamic Conference, which brought Muslim leaders to Senegal from all over the world and provided money for Senegal to build the “corniche,” a set of fancy highways and traffic tunnels on Dakar’s Atlantic Coast. Macky Sall (perhaps rightfully) attacked Karim by trying to audit his activity in this sector, but ultimately failed. A furious President Wade used the PDS legislative majority to change the Assembly president’s mandate from five years to one, and Macky Sall was expelled from the PDS soon thereafter. Many Senegalese felt that this was uncalled for, and this made Sall a political martyr of sorts. He left the PDS and many, like the current Interior Minister, followed him. Sall quickly founded his own political party–the Alliance for the Republic–and competed in the 2009 local elections three months later. APR has done well for two reasons: first, Macky has traveled throughout the country over the last three years, and this paid off in the 2012 presidential election. His access to the state over the last decade (as Prime Minister, National Assembly president, and former Minister of Mines) seems to have made much of this travel possible. Ultimately, Mbaye Ndiaye’s expulsion from the National Assembly in 2009 was due to his decision to follow Sall out of the PDS and into the APR, which was a direct threat to the ruling coalition. The ostensible goal of the legislative session was to discuss the merits and drawbacks of a “projet de loi” that Minister Mbaye Ndiaye proposed to the National Assembly. It served to postpone Senegal’s legislative elections to July 1, 2012 and prolong current National Assembly members’ tenure to July 20. Originally scheduled for June 17, the legislative elections approached very quickly after Sall was inaugurated as Senegal’s fourth president on April 2. As electoral law dictates, parties would have needed to submit lists of candidates for the legislative elections by April 7 at the latest. So as the new president, Sall immediately faced a choice: either dissolve the National Assembly (full of Wade’s ostensible partisans, for the most part), or retain the Assembly but propose it a law postponing legislative elections so that all parties have sufficient time to recuperate from the two-round presidential campaign before the law requires them to submit their candidates for the legislative ballot. Ultimately, President Sall consulted his allies and postponed the deadline for submitting candidate names while also asking the National Assembly to officially approve the delay. Only four of 150 congresspeople opposed this law, despite hours upon hours of discussion of it. Madiop Bitèye, the youngest PDS congressman in the Assembly, eloquently and parsimoniously pointed out the law’s major problems. For one thing, July 1 elections will not be logistically feasible in southern and eastern regions of Senegal, where the rainy season will be in full force and isolate many villages from each other and from the rest of the country. The law proposed the organization of re-votes in areas where a July 1 vote would disenfranchise large portions of the population, but Bitèye rightly pointed out that the law provided no specific criteria for determining when the rains became enough of a problem for the government to call a re-vote. In addition, Macky Sall claims that Wade left the government coffers empty and spent the last few weeks in search of 200 billion CFA francs to make good on basic campaign promises, including the lowering of food prices and the resolution of a prolonged strike in the education sector that risks holding all high school students back for a year. France and the EU have stepped up to assist Senegal in the last few days, but at the time of the National Assembly meeting, the government was still searching for financing, and Biteye wisely asked whether it was prudent to plan legislative elections for any time this summer if the state was out of money. Although discussing this “projet de loi” was on the agenda, many deputies turned the first Assembly meeting under Macky Sall as an opportunity to pontificate about how happy (or skeptical) they were about Mbaye Ndiaye’s new post, how proud they were of Senegal’s “political maturity” during the presidential elections, or how mad they were that Macky Sall did not declare his private assets before starting his work as President. The session was a great opportunity to speak out on such issues because the media were omnipresent at the back of the meeting room (cameramen) and in the bleachers with me (journalists). Macky Sall’s choice of Mbaye Ndiaye as Interior Minister was a popular topic on the podium, especially because Ndiaye had been a member of the National Assembly with all of the current members until his expulsion from the PDS (and hence his post as PDS congressman) in 2009. A range of goodwill was expressed: independent congressman Ousmane Sow Huchard (from Senegal’s green party, RES-Les Verts) heartily congratulated Ndiaye and shook his hand upon leaving the podium, while Ndeye Gaye Cisse (a PDS faithful to date) congratulated her former party colleague in a more backhanded way (something that goes roughly like, ‘Mr. Minister, I was skeptical of your appointment and scared for the country at first, but now that you are proposing this law I have more confidence in your commitment to Senegal’s well-being’). PDS hardliners also lectured their compatriots on keeping politicians out of the public administration, citing Ndiaye’s appointment to the Interior Ministry as a dangerous example of mixing the two. Once again, congresspeople outside of the PDS-led Liberal and Democratic coalition rebutted, this time with Amette Saloum Boye (Authentic Socialist Party) declaring that the Interior Minister under Wade, Ousmane Ngom, was just as much a politician as Ndiaye. Boye is in many ways correct: Ngom was the PDS’ #2 in the 1990s, and rumor has it that he has for a long time hoped to take over the party after Wade’s retirement. Thanks to Ngom’s personal conflicts with Wade, as well as the ascent of politicians like Macky Sall within the PDS during the 2000s, however, this dream increasingly slipped out of Ngom’s grasp. I always knew that being a member of the National Assembly in Senegal was time-consuming and personally expensive, but I never truly comprehended this until I tried to sit through a whole legislative session. Over 50 people were on the docket to speak, and even with only 1/3 of the deputies talking, relatively amusing speeches, and a nerdy personal interest in the Assembly, I could not stay in the bleachers until the vote. Only several hours later, after I had eaten, showered, and settled down on my living room couch, did the Assembly complete its task. The law passed, which means that the logistically challenging July 1 legislative elections are on. Main practical lesson learned: I need to travel to the eastern regions to finish my research there well before the rainy season, which harrows even the best and the brightest of congressmen!